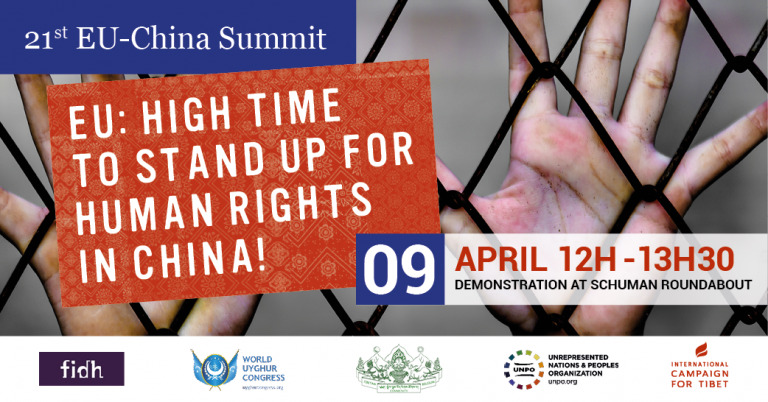 Brussels, 4 April 2019 – On the occasion of the EU-China Summit on 9 April 2019 in Brussels, FIDH, the International Campaign for Tibet (ICT), the World Uyghur Congress (WUC), the Unrepresented Nations and Peoples Organisation (UNPO), and Tibetan and Uyghur communities in Belgium have organized a joint demonstration to urge the EU to demand China be held accountable for its many human rights violations. The demonstration will take place from 12:00 – 13:30 at Petite Rue de la Loi at the Schuman roundabout. “We urge Presidents Tusk and Juncker to prioritize key human rights concerns during the Summit. Human rights issues should be fully incorporated and considered in all aspects of the EU’s relationship with China,” said International Campaign for Tibet’s EU Policy Director Vincent Metten. “Respect for basic human rights and freedoms must be a prerequisite for any meaningful relationship with China. Economic relationships with China should never take precedence over human rights. We therefore call on the EU to stand up for its fundamental values and principles during the EU-China Summit and to substantively raise the many serious human rights concerns with their Chinese counterparts,” said World Uyghur Congress President Dolkun Isa. The EU-China Summit comes at a time when the situation for Uyghurs, Tibetans, and all individuals who yearn for their basic rights and freedoms in China has reached a critical stage. Under the rule of President Xi Jinping, the Chinese government has been taking active steps to further erode the language, culture, religion and history of the Uyghur and Tibetan peoples in a campaign of total cultural assimilation. It is now largely impossible for Uyghurs and Tibetans to engage in even the most basic cultural or religious activities. This has culminated in the mass arbitrary detention of over 1 million Uyghurs in internment camps in Xinjiang – also known as East Turkistan. Calling on China to respect all people’s right to enjoy their own culture, history, language, and religion and to immediately halt its campaign of cultural assimilation and social reengineering targeting the Uyghur and Tibetan people. Demanding that Chinese government release all those held in arbitrary detention, especially the more than 1 million Uyghurs and other Turkic peoples held in internment camp as well as human rights defenders, activists, writers, religious leaders, and political prisoners held in arbitrary detention, including Tashi Wangchuk, Lodoe Gyatso, Uyghur Ilham Tohti, Eli Mamut, Hailaite Niyazi, Memetjan Abdulla, Abduhelil Zunun and Abdukerim Abduweli. Insisting on the need to implement the principle of reciprocity in EU-China relations, not only in terms of economic and trade relations but also with regard to access to Tibet and Xinjiang Uyghur Autonomous Region and freedom of the press.